Generally, when people picture a trampoline in their mind, they see a mesh jump mat, steel wire springs that may or may not be covered, and a steel frame. When people think about them, they remember horror stories from when they were younger and things that happened to themselves or others. Whether it was people falling off and breaking bones or slipping through the springs and getting severely pinched. Thankfully times have changed and some trampoline manufacturers have figured out ways to lessen injury concerns. It first began with safety nets that would completely enclose the jumping surface and then it further improved to become spring less. Can you imagine watching your children play as your parents, perhaps watched you, but without the worry that your parents once felt? Springfree trampolines could be the key, but you will have to judge for yourself whether the Springfree Jumbo Square trampoline is the trampoline you always dreamed of owning. 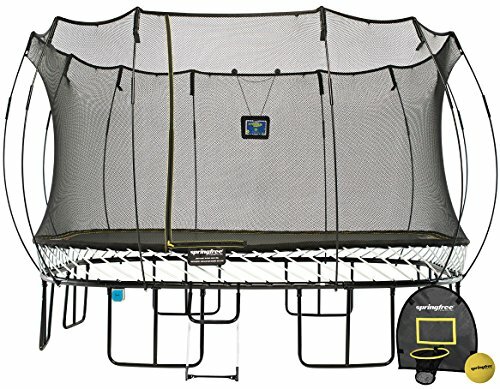 This trampoline is ideal for families who are concerned with safety, but want for their children to get outdoors and active. This square trampoline has a basketball hoop that is great for slam dunks and promises to provide a safe area for your kids to perform impressive tricks. Due to its size and weight capacity this is a great trampoline for the entire family. Multiple kids can jump on it at once. Adults can also jump on this trampoline. Depending on their weight they might have to jump with only one other person or alone . The downside of this trampoline is that it is more expensive than traditional trampolines. However, many people feel the extra safety of it is worth the extra cost. It is also difficult to set up for most people and some say that it is best to hire a professional, but in general, most are able to do it with only the help of videos and perhaps a friend or two. Q: Is there a potential hazard for small children? A: No. Small children will not be able to get on it without help from an adult. If they do, it is very safe because there are no springs that are close together and the safety net will keep them from falling off. Q: How does it hold up during extreme heat or coldness? A: The Springfree Trampoline is designed to be outdoors year-round without a cover. That is why it is both rustproof and weatherproof. Q: Is it difficult to set up? A: Even with the directions, you may have some difficulty setting it up, but it is not really any harder than other older style trampolines. It is a time-consuming project that is made easier if you have two people working on it. If you are not good with this type of work we recommend hiring a professional trampoline installer. Most current owners say that this is the best investment that they have ever made for their family, even if it is a little difficult to put together. Some do recommend that you follow the directions completely or you will have to start all over with the setup process. We would recommend finding a video on YouTube that explains how to set it up and follow it closely. The square shape provides massive bounce so that older children can perform tricks both with the basketball hoop and without. If you are interested in giving this trampoline a try, you should click here to read more owner reviews. If you want to consider cheaper options please see this article.